There’s the ponytail we wear to the gym, and then there’s that classic wedding ponytail that oozes modern chic appeal. Most of us will admit, we have hair envy when we spot that perfect ponytail. Some of us might even think that the perfect pony doesn’t actually exist based on our own failed attempts. Confession: we’ve yet to master the perfect ponytail ourselves but in the hands of professional hairstylists, it’s heaven wrapped in elastic! We love that the classic ponytail will grace the aisles of many weddings this 2018. Whether it’s relaxed and chic, or sleek and modern, the wedding ponytail doesn’t lack formal elegance. We’ve paid tribute to this chic hairstyle with our new Into the Night collection which includes some exquisite styles dedicated to the ponytail. We believe just because you’re walking down the aisle in a ponytail, this doesn’t mean you should go without a wedding veil or hair accessories. In fact, you can still style your look with a birdcage veil, fingertip veil or a full length chapel length veil, you’ll just need to factor in the comb style on the veil to ensure the look is proportional and flattering. The STAR GAZER birdcage veil was designed for the ponytail in mind. We’ve paired it with the exquisite DREAMER comb for a look that’s sophisticated with modern appeal. The BORDEAUX veil is the veil reimagined, this time for the classic ponytail. There’s no reason why a ponytail wearing bride should go without a veil, just because of her hair choice. This veil was designed to curve around the base of a ponytail and features exquisite Swarovski crystal elements for a touch of sparkle. 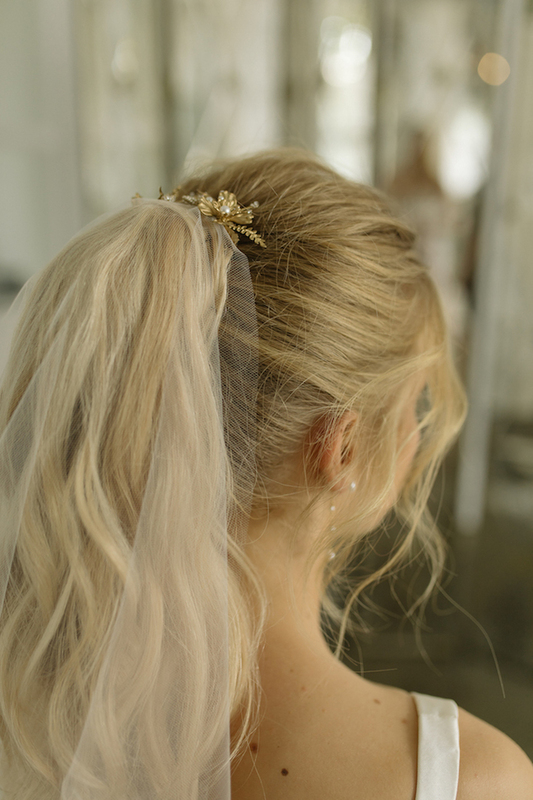 We love the look of a long ponytail with a long wedding veil. Styling is often about proportions and looking for balance, and the clean lines of the AUDREY veil complements so many wedding dresses and hairstyles – including the beloved ponytail. If a wedding veil doesn’t feel quite right for you, statement earrings are the perfect styling option for the ponytail obsessed bride. Whether it’s a drop earring or simpler crystal stud, wearing a ponytail on your wedding day is the perfect opportunity to showcase your style with some statement jewellery. Last, and certainly not least, we love to pair a perfect ponytail with simple wedding hair pins. Our STELLAR hair pin set and the GEMINI hair piece were designed specifically for this hairstyle. We love to work with our brides to design their perfect wedding accessories. 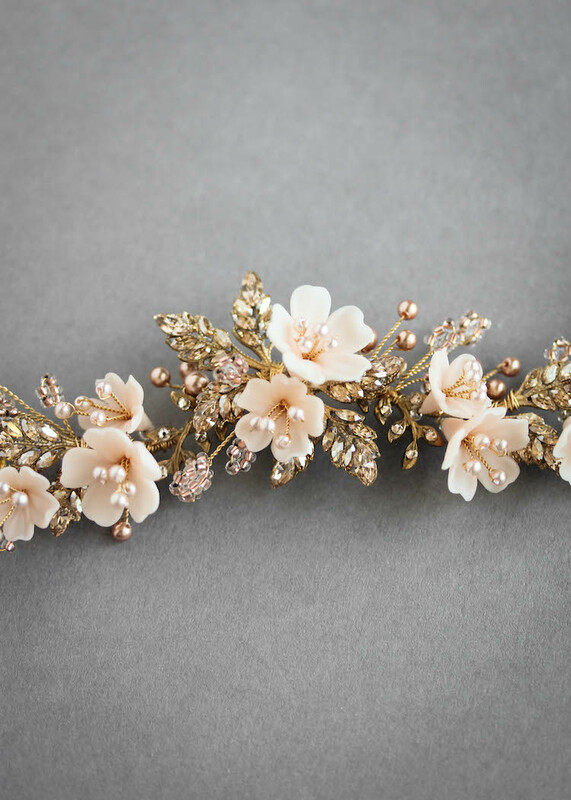 If you aren’t sure which accessories will best suit your wedding dress and hairstyle, feel free to send us photos of your bridal look and we can get back to you with ideas and recommendations from our collections.